Image caption An tadhal a bhuannaich Cupa na h-Alba do dh'Inbhir Nis. 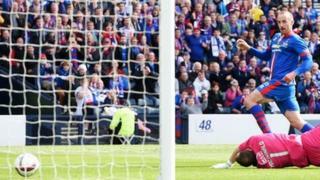 Cluichidh Caley Thistle Inbhir Nis am 1000mh geama aca oidhche Haoine an aghaidh Rangers. Thèid a' chlach-mhìle a chomharrachadh 's Caley Thistle airson togail air a' phuing chruaidh a thog iad an aghaidh Hearts an t-seachdain seo chaidh. Ghluaiseadh iad far bhonn na Prìomh Lìge agus os cionn Hamalton ma ghlèidheas iad na trì puingean. Tha Rangers ag amas air a' bheàrn eadar iad fhèin agus Obar Dheathain anns an dàrna àite a dhùnadh. 'S ann gu connspaideach a chaidh ICT a stèidheachadh nuair a chaidh sgiobaidhean Caledonian agus Thistle Inbhir Nis a chur còmhla ann an oidhirp àite fhaighinn ann an Lìog Ball-coise na h-Alba. Bha mòran de luchd-leantainn an dà sgioba gu tur an aghaidh a' ghluasaid, ag adhbharachadh argamaidean fìor shradagach aig na coinneamhan a chaidh a chumail mun chuspair. Chluich Caley Thistle a' chiad gheama aca sa Lùnastal 1994, 's iad a' dèanamh a' ghnothaich 2-0 air East Stirlingshire ann an Cupa na Lìge. Thar na 10 bliadhna às dèidh sin ghluais an sgioba Ghàidhealach tro na lìogan agus ann an seusan 2003/04, fo stiùir Iain Robasdan, choisinn iad àite anns a' Phrìomh Lìog. A thuilleadh air a' Chiad Roinn a bhuannachadh, thog iad Cupa Dùbhlan na h-Alba an seusan sin, 's iad a' dèanamh na cùise air an Àrd-Ruigh 2-0. Image caption A' chiad tadhal den chuairt dheireannaich ann an 2015. Thuit iad a-mach às a' Phrìomh Lìog ann an 2009 ach thill iad an seusan às dèidh sin. Ann an 2014 fhuair iad chun na ciad chuairt dheireannaich mhòir aca, 's iad a' call air breaban peanais ri Obar Dheathain ann an Cupa na Lìge. Bha nas fheàrr ri thighinn an ath-sheusan, ge-tà, 's iad a' ruighinn cuairt dheireannach Chupa na h-Alba às dèidh dhaibh a' chùis a dhèanamh air Celtic ann an geama nach robh às aonais chonnspaid. Bhuannaich iad 2-1 an aghaidh na h-Eaglaise Brice gus Cupa na h-Alba a thogail airson a' chiad turais nan eachdraidh. Bha an iomairt a b' fheàrr aca riamh san lìog an seusan sin cuideachd 's iad a' crìochnachadh san treas àite. Mar thoradh air Cupa na h-Alba a bhuannachadh chluich Caley Thistle a' chiad gheama aca ann am farpais Eòrpaich ann an 2015. Anns an dàrna cuairt dhearbhaidh de Lìog Europa chaill iad 1-0 thar an dà gheama an aghaidh Astra Girugiu à Romàinia. An seusan seo, tha cùisean air a bhith dùbhlanach do sgioba Richie Foran, 's gun iad air geama a bhuannachadh anns an lìog bhon Damhair, gam fàgail aig bonn na lìge. Air thoiseach air a' 1000mh geama aca, thuirt Foran gu bheil e an dòchas brath a ghabhail air an t-suidheachadh sa bheil Rangers. "Tha iad beagan troimhe-chèile an sin", thuirt Foran. "Bu chòir gum bi iad a' faireachdainn beagan cugalach 's tha sinn an dòchas brath a ghabhail air sin. "Oidhche Haoine, 's urrainn dhuinn faighinn far bhonn na lìge. Dè cho mòr 's a bhiodh sin don chluba, an luchd-leantainn agus na cluicheadairean? ", thuirt e.